To meet growing demand, the FAO has estimated that world poultry production needs to grow by 2-3% per year to 2030. Much of the increase in output already achieved has been as a result of improvements in commercial breeds combined with rearing in more intensive production systems. However, more intensive systems have increased the risk of transmission of animal diseases and zoonoses. Consumer expectations of sensory and nutritional quality have never been higher. At the same time consumers are more concerned about the environmental impact of poultry production as well as animal welfare. Drawing on an international range of expertise, this book reviews research on poultry breeding and nutrition. The first part of the book reviews how advances in genetics have impacted developments in breeding. Part 2 discusses ways of optimising poultry nutrition to ensure quality and sustainability in poultry meat production. Chapters review the use of feedstuffs and ingredients such as amino acids, enzymes and probiotics as well as feed formulation and safety. 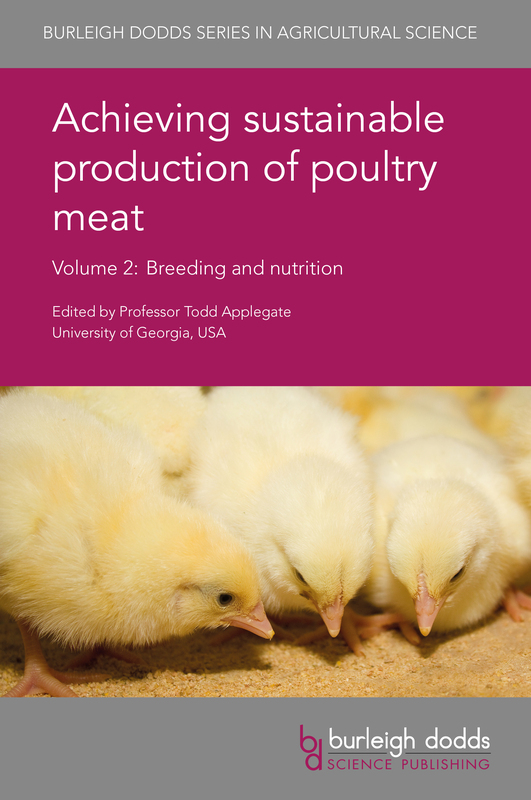 Achieving sustainable production of poultry meat Volume 2: Breeding and nutrition will be a standard reference for poultry and food scientists in universities, government and other research centres and companies involved in poultry production. It is accompanied by two further volumes which review safety, quality and sustainability as well as poultry health and welfare. "The proposed list of authors is impressive and this will certainly be an excellent publication in poultry science."